The Hippodrome Casino is a unique British landmark and became famous as a well-known entertainment establishment in the 1900’s, boasting celebrity acts like Judy Garland, Shirley Bassey and even the great escape artist Harry Houdini wowed the crowds from the stage. After extensive renovations, the Hippodrome opened its newly refurbished doors as a land based casino in 2012 with the online casino following short hot on its heels in 2013. Given its history and experience, Hippodrome Casino knows how to do it grand and how to do it well. 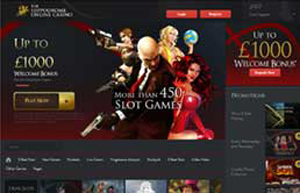 This stylishly designed website online casino prioritizes client satisfaction and ensures security and safety alongside nonstop entertainment. Hippodrome Casino offers a multitude of safe and trustworthy banking methods, and all transactions are digitally encrypted with the latest SSL encryption technology, guaranteeing all their clients the highest possible level of security. Depositing funds into your account has never been easier and transactions can be made through Visa, MasterCard, PayPal, Neteller, Skrill, Paysafe, Entropay, EcoPayz, Skrill 1-tap, Click and Buy, or Direct Bank Transfer. A minimum deposit amount of only £10 is required, with no upper limit. Withdrawing your winnings can also be made through the above mentioned available methods, with the exception of Paysafe, Entropay and Skrill 1-tap. Withdrawn funds are paid via the same method that was used when making your deposit, and funds are cleared in a timely and efficient manner. Unlike a visit to a land based casino where you won’t receive much of anything for free, the Hippodrome online casino offers a very generous £1,000 sign up bonus to all their new clients. The bonus is broken up into three stages: The first deposit made will be matched 100% up to £250, your second deposit gains you a 25% match up bonus up to £250, and your third bonus will be matched 50% up to £500. Remember to tick the box marked “I wish to receive the Welcome Bonus” during your registration process if you want to qualify for this fantastic offer – and I couldn’t think of anyone who would want to refuse such an awesome gift. It’s not only newcomers that receive that extra bit of special attention with the welcome bonus, as this casino’s loyal and returning customers are also handsomely rewarded through Hippodrome’s impressive six tier loyalty programme. Every time you play at their online casino, you earn and collect loyalty points which you can then exchange for cash credits. American Roulette, Slots, and the Parlour Games count 100% towards these points earned, and you will receive 5 points for every £10 wagered on these games. You will ascend through six levels: Red, Silver, Emerald, Platinum, Diamond and Privé, with bigger and better rewards becoming available the higher up you move, including exclusive offers such as, bonus points and bigger bonuses. ENJOY PLAYING ON YOUR MOBILE DEVICE? Not all casinos perform equally on every device and so our editors stringently test in all environments before recommending the best overall casinos to you. Any client embarking on a trip into a real money online casino needs the assurance of safety and security regarding their personal information and processed transactions, and in this regard Hippodrome Casino certainly comes across as a leader of the pack with the double protection of their Malta Gaming Authority and Great Britain Gambling Commission licences proudly on display, as well as the incorporation of the most progressive SSL digital encryption technology currently available. The Hippodrome Casino has partnered with the legendary Microgaming for the design of their platform and their vast assortment of games. This software giant can proudly boast with more than a decade of experience in this arena, which can certainly be appreciated in the superb site set-up, as well as the gloriously animated games available. With a truckload of innovative games available in the gallery it’s certainly a hat’s off to Microgaming regarding the smooth and seamless integration of games with the overall user-friendly interface. Additionally, Hippodrome games carry the eCogra seal of approval for fair play and impartiality on all their games, which are re-evaluated on a monthly basis. There is an incredible array of more than 450 beautifully designed games available in Hippodrome’s arcade, and as the casino is browser based and designed for instant play, with no download necessary, you have immediate and instant access to the full stack by just one click on either your PC or mobile device. The games are well organized and categorized on the homepage of the site, ensuring you will have no trouble finding all your old favourites, or looking up a new game you’ve been dying to try out. The biggest assortment of games can be found under the Slots category with every variety imaginable available in stunning graphics and realistic sound, from which you can conveniently choose out of the 3-reel slots, 5-reel slots, multiplayer or fruit machines, as well as the progressive jackpot slots with Mega Moolah being the most popular. In the Roulette arcade you will find old favourites like American, European and French Roulette. There is also Multi-Wheel and Multiplayer Roulette available, as well as the Premier and Gold Series Roulette with their added-on features like video zooming, history section and turbo play. The Blackjack section offers a variety of 15 games, and the Live Dealer Games include titles like Baccarat and Casino Hold’em, which are streamed to your screen via webcam. In the highly unlikely event that something should go haywire, or you have a burning question that the site itself cannot answer, Hippodrome encourages you to get in contact with their trained, professional and friendly customer support who are available 24 hours a day, every day of the week, for all the days of the year. You can into contact by calling their toll-free numbers at UK: 0-808-238-9840; Canada: 1-877-907-4248; Rest of the world: +44-808-238-9840; or by sending off a quick e-mail to [email protected] Alternatively, you are more than welcome to make use of their instant chat feature which gets you talking to a real live person in a moment within moments, which is available on your PC, Mac, mobile phone or tablet. While the Hippodrome name and structure are not new to the British community, their online and mobile version has most certainly made an international name for itself as an extraordinary alternative to its brick and mortar big brother over in London. Everything on this site screams functionality and client satisfaction with their almost overwhelming gallery of game options, the sleek design of the platform and games alike, incredible customer support services, as well as the enticing welcome bonus, promotions and loyalty programme available to all its members. On all fronts this casino is the ultimate playground for UK gamers and scores top marks as a safe and secure site on our list of recommended online casinos. Your senses will be stimulated by all the thrills and delights available, and we can’t fathom why you are still sitting reading our review, instead of taking the plunge and joining in on all the fun that Hippodrome has to offer! I'm glad I gave this a try because it didn't disappoint from start to finish. I've spent countless of hours on this online casino site and have not regretted a minute of it! This casino constantly puts out other great promotions too. They do a great job at replicating the same thrills from a land-based casino. They have an extremely helpful support team who solved my payment issues in minutes. I managed to claim my welcome bonus without any trouble at all. What withdrawal methods do Hippodrome Online have? Withdrawals can be made through any of the following options: Visa, MasterCard, PayPal, Neteller, Skrill, EcoPayz, Click and Buy, or Direct Bank Transfer. Is Hippodrome Online safe to play on? Most definitely. With not one, but two, licences from the governing bodies Malta Gaming Authority and Gambling Commission in Great Britain, as well as state of the art SLL encryption, you will be gaming on one of the safest and most trustworthy casino sites available. Does Hippodrome have a land-based casino? Yes they do. The brick and mortar big brother is a national landmark and is situated in London, England. Our resident experts have elaborated industry leading guidelines known as a Seal of Approval (SoA) to help you always pick the right casino. While there are potentially dangerous casinos out there masked as the real deal, we've chosen a small selection of outstanding operators to bear our Seal of Approval ascasinos that you can trust. BestOnlineCasinoSites.com was created with the intention of providing players from around the world with the best online casinos available. Our team constantly reviews new online casinos and ensure we only recommend 100% safe and secure platforms to play on.